Damn, Japan, you completely schooled us. 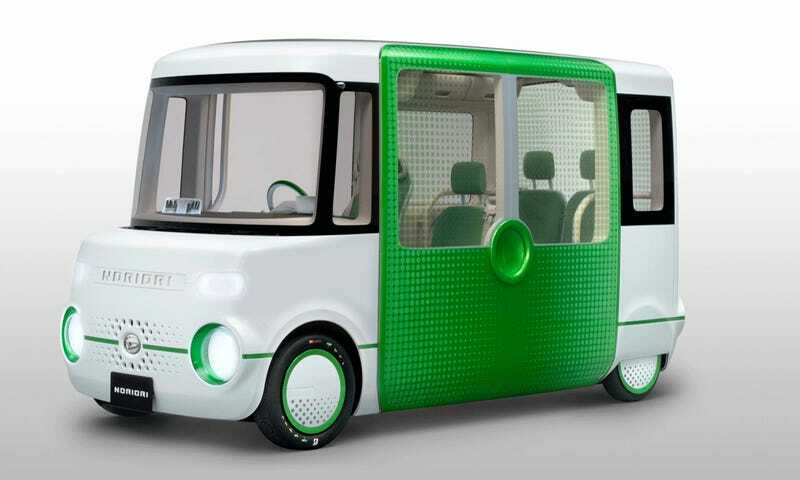 There is no vehicle that us Americans have even dreamed of that is as forward in space-utilization as the Daihatsu Nori Ori concept unveiled at the Tokyo Motor Show. Basically, you’re looking at a kneeling bus, only scaled down to the size of a subcompact car. How the suspension lowers Daihatsu does not say. Ah, the joys of concept cars! Daihatsu specifically designed this vehicle to accommodate those in wheelchairs, so the suspension can lower to the ground, and a ramp slides out from the side and rear doors. The drivetrain is standard Daihatsu kei-car fare, a 2/3rds liter straight-three with regenerative braking good for 94.1mpg, according to AutoCar at least. Also it appears to have musical notes for eyebrows. I would live in this car.